Dodgers cool for Game 2 after hot World Series win: Only 100 Wednesday? It’ll still be blistering hot Wednesday — but not a record breaker — when the Los Angeles Dodgers try to take a two games to none lead in the World Series at Dodger Stadium. With the mercury at 103 for the first pitch at Tuesday evening’s game, Wednesday’s face-off with the Houston Astros will be relatively cool — maybe just in the high 90s or 100. The high temperature forecast for nearby downtown Los Angeles is for 100. The Los Angeles Fire Department reports that it tended to 22 people at Tuesday evening’s opening game of the World Series at Dodger Stadium, and took seven of those to a hospital. One patient had a seizure, another complained of chest pains, but none had life-threatening issues, according to the LAFD’s Brian Humphrey. The game-time temperature was 103 degrees, but none of the patients had specific heat-related complaints. The Dodgers Wednesday will send left-hander Rich Hill to the mound against Houston Astros right-hander Justin Verlander. 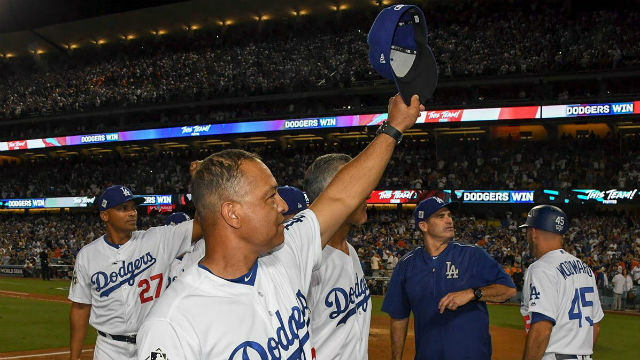 The Dodgers won Game 1 Tuesday as Justin Turner hit a tie-breaking two- out, two-run home run in the sixth inning and Clayton Kershaw and two relievers limited the Astros to three hits in a 3-1 victory in before a capacity crowd at Dodger Stadium announced at 54,253. Winners of the first game of the World Series have gone on to win the Series 70 of 112 times, 62.5 percent, including 12 of the last 14, with the 2009 Philadelphia Phillies and 2016 Cleveland Indians being the exceptions. The Dodgers are the 65th home team to win Game 1. Of the previous 64 Game 1 winners, 43, 67.2 percent, have gone on to win the World Series, including 13 of the last 14, with the most recent exception being the 2016 Cleveland Indians. In 19 of the 31 World Series since 1985, the Game 1 winner has also won Game 2. Game 2 will include recognition of eight veterans of the Vietnam War as part of the United States of America Vietnam War Commemoration which began on Memorial Day 2012 and will conclude on Veterans Day 2025. The honorees include former Navy Capt. Charlie Plumb of Calabasas, who was a prisoner of war for six years and recipient of the Silver Star, Legion of Merit, Bronze Star and Purple Hearts, and former Army Sgt. Roy Gleason of Temecula, the most recent major leaguer to be awarded the Purple Heart. Gleason played eight games with the Dodgers in 1963, doubling in his only major league at-bat. The game ball will be delivered by 17-year-old Alanna Moore, a senior at CATCH Prep Charter High School in Leimert Park. In Game 1, Chris Taylor hit Dallas Keuchel’s first pitch over the fence in left-center field for a homer leading off the bottom of the first inning in the hottest known World Series game. Kershaw allowed three hits, including Alex Bregman’s solo homer in the fourth, struck out 11 and did not walk a batter in seven innings. Brandon Morrow pitched a perfect eighth inning. Kenley Jansen retired all three batters he faced in the ninth, striking out one, for the save. Kershaw is the first pitcher in World Series history with 10 or more strikeouts, no walks and three or fewer hits allowed in a World Series game, according to ESPN Stats & Info. Taylor’s home run was the fourth leading off a Game 1 of the World Series. The most recent one was Alcides Escobar of the Kansas City Royals off Matt Harvey of the New York Mets in 2015. Taylor was the 38th player to hit a home run in his first World Series at-bat, the first since teammate Chase Utley in 2008 when he played for the Philadelphia Phillies. Taylor extended the sixth when he walked on a 3-1 pitch with two outs and the bases empty. “Good thing I did because I didn’t get beat the third time,” Turner said after hitting his fourth home run of the postseason. Turner said the heat helped make the home run possible. Turner has driven in 14 runs in the postseason, the most RBIs by a Dodger in a postseason, breaking the record previously set by Dusty Baker, who had 13 in 1977, when the postseason consisted of two rounds — the league championship series and World Series. The temperature when Kershaw threw the game’s first pitch at 5:11 p.m. was 103 degrees, the highest known temperature for a World Series game. Records date back to 1975. The previous hottest known World Series game was Game 1 of the 2001 World Series between the Arizona Diamondbacks and New York Yankees in Phoenix on Oct. 27, 2001, when the first-pitch temperature was 94 degrees and Major League Baseball ordered the roof at the then-Bank One Ballpark to be open, according to The Weather Channel, citing information from a blog by National Oceanic and Atmospheric Administration meteorologist Alex Lamers. The other World Series game with a temperature above 90 degrees was Game 6 of the 2001 World Series in Phoenix, when the high was 91. Keuchel was charged with the loss, allowing three runs and six hits in 6 2/3 innings, striking out three and walking one. The crowd included retired Dodger broadcaster Vin Scully, Hall of Fame pitcher Sandy Koufax, talk show host Jimmy Kimmel, comedian Jerry Seinfeld and Basketball Hall of Fame member Kareem Abdul-Jabbar, according to Major League Baseball. The crowd was the largest for a World Series game since Game 6 of the 2003 series at the since-demolished Yankee Stadium drew a crowd of 55,773 to see the Florida Marlins complete a six-game Series victory over the New York Yankees. The game was the first World Series game at Dodger Stadium since Oct. 16, 1988, when Orel Hershiser, now a Dodger broadcaster, pitched a three-hit shutout in a 6-0 victory over the Oakland Athletics in Game 2 of the series, won by the Dodgers, four games to one. The time of the game was two hours, 28 minutes, the shortest World Series game since Game 4 of the 1992 Series between the Atlanta Braves and Toronto Blue Jays, which took 2:21 to play. This is the first World Series matchup since 1970 when both teams won at least 100 games in the regular season. The ceremonial first pitch was thrown by Rachel Robinson, the widow of Jackie Robinson, who broke baseball’s color line in 1947, and their children Sharon and David. Gospel singer Keith Williams Jr. sang the national anthem.